The body of the PAR38 infrared lamp is made of pressed glass, which is very robust,the average life is 5000 hours, This infrared lamp can convert the electric energy to the infrared thermal as much as possible. In terms of quality control and management, we passed the ISO9001-2000 quality management system certification, as well as CE certificate, the full inspection of every production processes has being carried out. Currently, the available power includes 100W/150W/175W, the available voltage is 110~240V, also we can make according to your requirement. This PAR38 infrared lamp is widely used for animal husbandry rasing, cosmetics & grooming,medical care, specially for the livestock incubation. The panel heating system of the PAR38 infrared lamp is more effective and save the heating cost in the farm in the winter. Compared with the other heating system, the R125 infrared lamp has some advantages, such as the low cost, easily installation, and avoid air pollution in the farm, energy saving, So this infrared lamp is widedly used home and abroad. 1. Top quality from brand manufacturer (made for top Europe brand). 2. 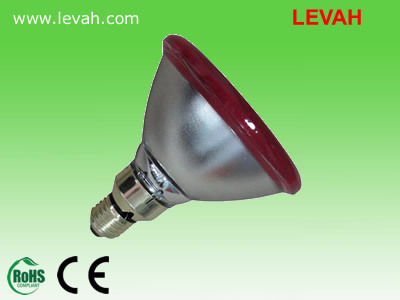 E27 imported brass head, with high quality. 4. Evergy saving 30%. 100 Watt consumption => 175 Watt heating power.